Pause Game. The objectives of this mission is very similar to the previous one and so I will use a similar amount of housing. The land area may seem problematic with scattered rocks that cannot be removed, or the ridge that crosses the land area. But the block I have in mind will fit near the coastline close to the farmland. The resources at hand are timber, sand, clay, marble and gold. We can also grow grapes and keep sheep. The refined goods we can produce are clothing, glass, pottery, jewelry, wine, armour and weapons. I will earn more per year from exporting wine than exporting jewelry so I will focus on that. I will also produce all basic goods and let all glass go to exports. I build farms and fields (2 grain, 2 vegetable, 1 sheep, 1 grape) on/near the northern farmland and a clay digging camp and a sand digging camp in the same area. I also build a granary (mothballed). 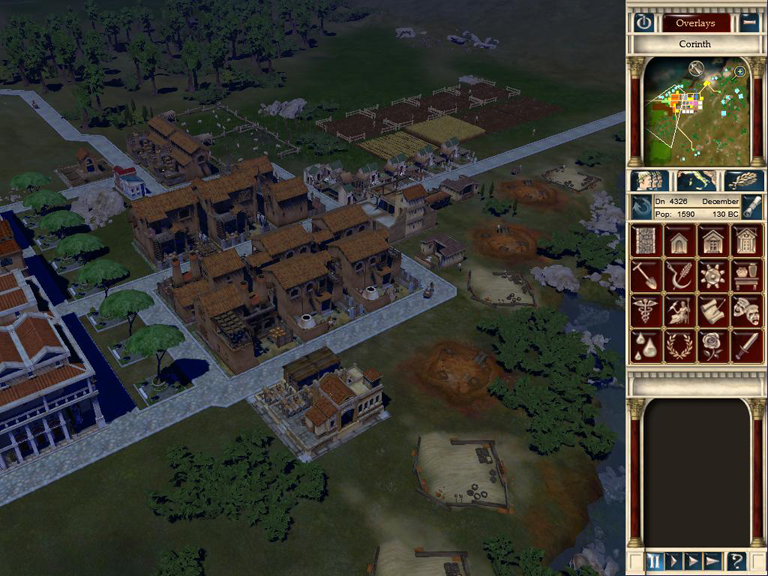 I open the trade route to Latium (mothballed) and a marble quarry, and connect the two with a road. I build a gold digging camp (mothballed). The factories will go between the northern farmland and the housing block. I build a pottery, clothing, jewelry, 2 wine and 2 glass factories, and motball them all. To avoid complaints about desirability I plant 3 large trees. Unpause game. I let the immigrants settle and open up services as the workforce increase. In June the food is ready so I start selling to the people. Pottery is ready shortly after but I wait with sales until the houses have collected food, otherwise there's a risk they will emmigrate. In August the basic goods market opens and starts selling pottery. I also accidentally sell a small stock of glass because I didn't uncheck the box in the market menu. In September the wool is ready. I open the clothing factory. I'm now 57 plebs short. In October that number has flipped and there are now over 100 unemployed plebs. I open the port to Macedonia and starts exporting wine. I also open up trade to Sardinia, build a port and start exporing glass. In November the gold digging camp opens, and later, the jewelry factory. In December all previously built factories are up and running and I have also built a second clothing factory and a second pottery factory. I am again short on plebs - 12 only. The sales of clothing picks up in February. 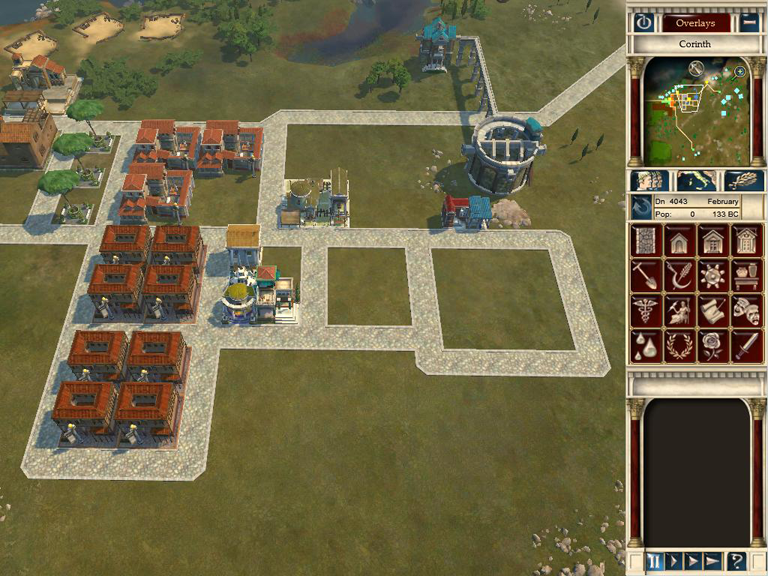 With new workers I can build a second jewelry factory and a warehouse. In March Rome demands jewelry. I have 2 units. I change the export rates of all goods to keep a small stock in case Rome demands something. 10 for marble and glass, 15 for wine and jewelry is already set to 30. In June a fire breaks out in one of the insulae. The city is now large enough to need a second set of prefects and engineers. I build them near the cluster of factories. I start looking into placement of villas and to offer them all access to a shrine I move the Jupiter shrine slightly to the east. This saves me having to build a second shrine, or placing villas where I don't want them. As soon as they arrive they complain about desirability so I surround their houses with roads and lay plaza type 1. I build a luxury goods market in August and a 4th domus. When the new arrivals join the city I build an odeum. With 3 months and 2 weeks to spare I ship the jewelry to Rome. Time to sell jewelry to the city. My villas demand more hygiene and since I'm cheap I give them a small barber shop. In February Rome requests wine. I have some in stock but not all so I increase the export rate to 25. 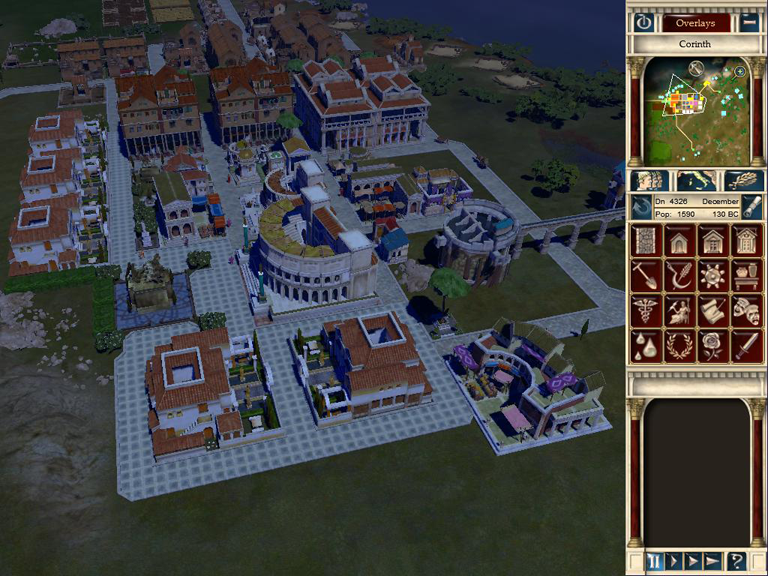 I build an actors guild and a theatre, and 3 more villas. In May my stock of wine is large enough to send some to Rome. My villas start to demand exotic goods. I start importing incense at a limit of 2. I also build a school. In September Rome sends a tall order of 100 glass. I have 18 months to fulfill this demand so I quickly change the export limit to 110 and build 1 sand collecting camp and 2 glass factories. To avoid having to build a 9th insula I choose to mothball half of the pottery and clothing factories. This way I don't have to build additional farms to feed more people. Besides, sales are slower than production. In order to reach the cultural requirement I need to build a second shrine, and to get perfect coverage I need to move the clinic and place the new shrine (Ceres) in its place. I spend the year watching the stock of glass build up until I can ship it to Rome. I get a request for marble in March. I increase the export limit to 45 and wait. I build another warehouse for the glass. In June there's enough glass to send to Rome. Shortly thereafter Rome requests more glass. This time only 50. I lower the export rate to 60. I also mothball one of the jewelry factories. I could open up trade routes to Asia and export some of the jewelry but I am so close to winning the scenario that I don't want to bother. In December Rome demands jewelry. I don't bother. I have enough glass to send and win the scenario.